Varna Medical University was initially established in 1960 as a Higher Medical Institute and was the first higher medical school in northeast Bulgaria. The expansion of the institute led to the building of new hospitals for the healthcare needs of Northeast Bulgaria. The Obstetrics and Gynaecology Hospital, Psychiatric Hospital (the largest on the Balkans), Eye Hospital, and the Therapeutic Hospital (current University Hospital “St. Marina”- Varna EAD). 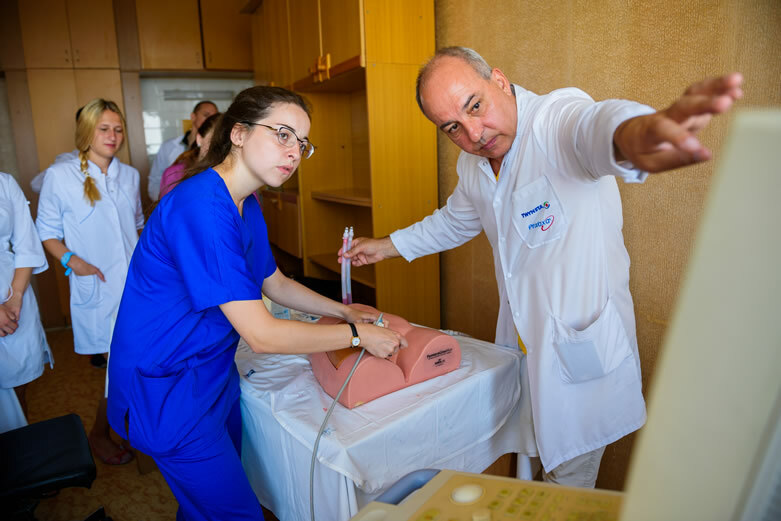 Not only facilitate convenient practical training for students but is the central medical care hub for the public of Varna. Today, Varna Medical University is the regal centre for medical staff education, for scientific research and innovations, for therapeutic, diagnostic, consultative, organizational and methodological assistance with all the modern equipment. Students get the once in a lifetime opportunity to study at one of the most prestigious universities in Bulgaria, offering education that is accredited in Europe. 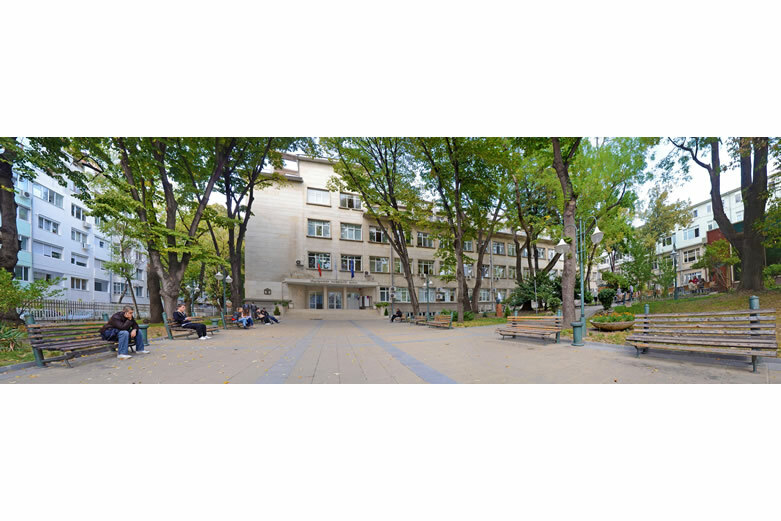 The Medical University of Varna is the first and the only one of its kind in Bulgaria to introduce the model of the European Foundation for Quality Management (EFQM®) for Business Excellence in 2008. With its highly qualified academic staff, with its impressive clinical training facilities, two student halls of residence, a modern University Library and a Publishing Centre, the University meets all the international and European requirements for an independent higher educational establishment. There is a theatre group and a rock band at the University organized by the Student Council and the student associations, to which students of MU-Varna belong (the Association of Medical Students, the Association of Students of Dental Medicine and the Association of Students of Pharmacy). 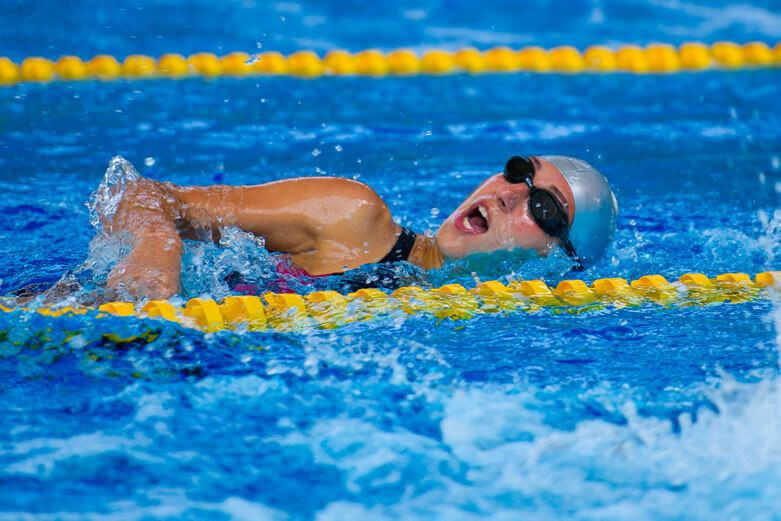 The University promotes sport activity such as volleyball, basketball and football and tennis, trained by professional coaches. ‘Students organize Talent Shows, where everyone has the opportunity and freedom to show their artistic skills and talents. Starting from all the facilities to extracurricular activities; The University has not spared anything to provide the best nurturing environment for its student s to excel to their maximum potentials. 4. Health Certificate from a hospital or GP stating the applicant is vaccinated against hepatitis B, any other chronic diseases and a psychological assessment. 5. Personal statement stating credentials, educational status, interests, hobbies and travel experiences. The Bulgarian lands are ancient crossroads. They were populated from remote antiquity and remember many ancient civilizations and different cultures have influenced Bulgaria. Bulgaria has an emerging market economy in the upper middle income range, where the private sector accounts for more than 80 per cent of GDP. From a largely agricultural country with a predominantly rural population in 1948, by the 1980s Bulgaria had transformed into an industrial economy with scientific and technological research at the top of its budgetary expenditure priorities. Bulgarian history really starts with the Thracians. The Thracians were a group of Indo-European tribes that lived throughout the Balkan Peninsula from about 1000 BC. With such a long and tumultuous history, it’s hardly surprising to find that Bulgaria still harbours impressive stony reminders of the ancient peoples and civilisations that have risen, fallen, conquered and passed through this land. Signs of 2500-year-old Greek and Hellenistic colonisation are evident along the coast, while elsewhere, fortifications, bathhouses and theatres indicate the reach and resources of the Roman Empire at its zenith. The fearsome Thracians left their mark across the southern and central areas of Bulgaria, and the tombs of some of their kings and nobility can still be seen today. Bulgaria has as moderate and transitional continental climate with four seasons with a dry and hot summer. A Mediterranean climate, with dry summers and mild, humid winters, prevails in the valley of the southwestern Rhodope Mountains. The average temperatures ranges between 2° in January and July temperature ranges between 19° and 30° C. The northern limits of the climatic zone is the Balkan Range. There are three national parks established in the country: Pirin National Park (a UNESCO natural heritage site), Rila National Park, and the Central Balkans National Park. There are also 11 nature reserves – Belasitsa, Balgarka, Vratsa Balkan, Golden Sands, Persina, Rila Monastery, Rusenski Lom, Sinite Kamani, Strandzha and the Shumen Plateau. The natural landscape of Bulgaria is diverse, consisting of lowlands, plains, foothills and plateaus, river valleys, basins, and mountains of varying elevations. There is an extensive network of air, road and train services in Bulgaria. Most tourist sites are accessible by public transport. Buses are common for urban transport. In addition to them trams and trolley buses are typical in the big cities. Similarly to other European countries, Bulgaria offers a rich and diverse cultural and social life. Living in Bulgaria is predominantly cheaper than other EU member countries. For this reason, it is an extremely popular destination for students. Bulgarians enjoy and love spending their leisure time eating and drinking out. Many Bulgarian food products and dishes are popular internationally. You can find almost any cuisine in the numerous restaurants. Many supermarkets are open 24/7, restaurants work seven days a week and there is a convenience store on pretty much every corner and there’s even some bank branches open on weekends. Three mobile service operators provide Bulgaria with almost 100% 2G and 3G network coverage both on its territory and on territorial waters. There is also internet coverage almost everywhere in the country. In the larger towns and cities, there are Wi-Fi spots with free internet access. These are located mainly in the trade centres, railway stations and bus stations. Bulgaria is popular for sports such as wrestling, weight-lifting, boxing, gymnastics, volleyball, football and tennis. Football is by far the most popular sport. Bulgaria is a hiking paradise. This relatively small country abounds in a lot of mountains – big and small, high and not so high mountain ranges are dissected by thousands of kilometres of tourist paths and tracks belonging among the best designated ones in Europe. The city of Varna is the sea Capital of Bulgaria and is a great location situated along the Northern coast of the Black Sea. It is the third largest city in the country. Varna is a major industrial, cultural, tourist and academic centre in the North – Eastern region of Bulgaria. With its sublime and unique attraction, it is no wonder why Varna boasts more than 125 years of history and traditions in tourism too and is a top choice for students who travel to Europe for their further studies. With its 17 km long sandy beaches and its abundant natural resources, Varna offers superb conditions to have the coastal, Mediterranean living style with development of eco-tourism, balneology and SPA centres. The internationally recognized resorts of Golden Sands, Sunny Day, Albena, Riviera and St. Constantine and Elena (the oldest seaside resort in Bulgaria), are located in the vicinity of Varna. The region has a moderate climate with humid winter and a hot sunny summer. The expanse is remarkable for its diversity of natural and archaeological sites. One of the two main bird migration routes crossing over it. In the city centre you’ll find Bulgaria’s largest Roman baths complex and its finest archaeological museum, as well as a lively cultural and restaurant scene. Varna has some of the finest and oldest museums, professional arts companies, and arts festivals in the nation and is known for its century-old traditions in visual arts, music, and book publishing, as well as for its bustling current pop-culture scene. Over the past few decades, it developed as a festival centre of international standing. Varna is a front-runner for European Capital of Culture for 2019. Varna is a city with famous drama and puppet theatre, opera and philharmonic orchestra. It is home to The Palace of Culture and Sport and the Festival Congress Center, which allow a lot of international cinema festivals, scientific forums and sport events held there. One of the symbols in Varna is the Sea Garden which is a great place to go for a walk and relax. The Garden is a national monument of garden and park art, where the Dolphinarium and Aquarium are located. There is ample verity to how you can enjoy the life in Varna and it is not surprising why it is a student attraction in Europe for the unique life experience it can offer them throughout their academic years. 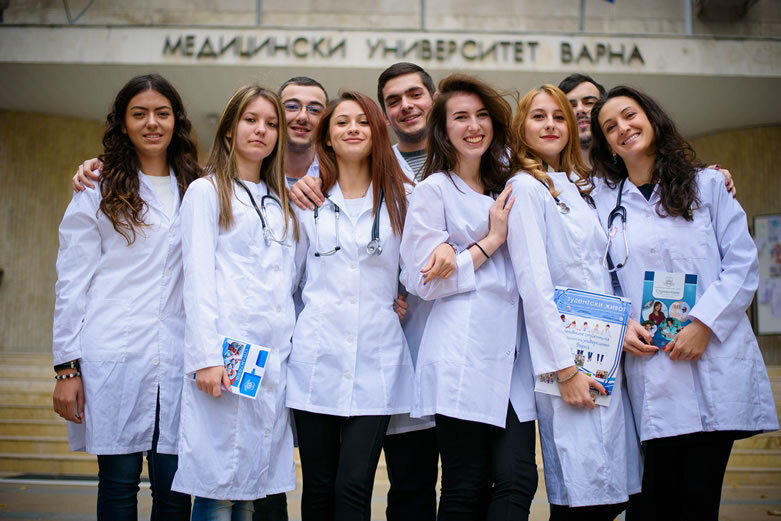 With a 50 year experience Training both local and international students, the general medicine study at Varna Medical University is pioneer among many Universities in the European region. After the successful completion of the 6-year course of academic studies in the Medicine, students are awarded a Diploma of completed high Graduates receive a Master’s degree along with possession of that degree enabling to graduates to practice medicine in EU countries. Graduates can also practice in many other countries. The six year programme is: ten semesters and one-year of state clinical internships (310 calendar days). Instructions, labs, lectures and examinations are all conducted in English and the six year program is identical to the Bulgarian language program. The first two years focusses on the fundamental or basic science courses channelling the studies towards those biomedical sciences that are most relevant for a practicing physician. The preclinical education is integrated to the clinical one. The most exciting part of the course begins when lectures and lab classes translates into patient care. The third year coaching is exclusively done in clinical settings and involves work with patients admitted for treatment at the University teaching hospitals. The academic process is structured to various modern teaching methods. Graduates of the Medical Programme acquire specialized theoretical knowledge in a range of pre-clinical and clinical topics. The pre-clinical and clinical subjects are fundamentally covered through lectures, seminars clerkships, specialized practice and consultations. With regards to practical skills; students acquire therapeutic and clinical methods to acquire qualifications for specializing in various respective fields and in medical research. The training is focused on achieving a broader general medical education. The Students train to become physicians and surgeons capable of providing professional medical aid and care aimed at preventive aspects of medicine with a broader general medical education. The Central library of the medical university has a comprehensive collection of medical literature with more than 160000 volumes of hard copies and the building facilities span over four buildings including a centralised and digitised Library collection. The Faculty of Dental Medicine comprises five departments with 77 lecturers, 13 of them having academic rank. It prepares specialists with higher education in dentistry, postgraduates and PhD graduate students in the basic dental specialties. The Faculty has a new, fully equipped building for the aims of theoretical and practical training of students since 2008 and the faculty itself was founded in 2006. The programme is designed for students to graduate as a doctor of dental medicine, practically equipped and prepared to practice general dentistry in an evolving subject area. The course is full time and spans over 6 years with three progressive stages. The first two years are training based on biological and medical subjects and is the first stage. Clinical and medical training is conducted from second to tenth semester covering specialised training in general medicine and clinical discipline. This is the second stage. The pre-graduation practical internship is the final and third stage which is performed as cycles in prosthetic dentistry, conservative dental treatment, periodontology and diseases of the oral mucosa; oral and maxillofacial surgery, paediatric Dental Medicine, orthodontics and every cycle ends with a state examination. – Adequate knowledge of clinical medical and dental disciplines which allow the doctor in dental medicine to have a comprehensive picture of anomalies, lesions and diseases of teeth, mouth, jaws and related to them tissues, as well as preventive, diagnostic and therapeutic dental medicine. Upon graduation, students obtain the professional qualification of “Master-doctor in Dental Medicine” and education and qualification degree “Master’. Students acquire qualifications for specializing in various respective fields and in medical research. The training is focused on achieving a broader education graduating professionals capable of providing professional dental care with a broader general medical education. The Central library of the medical university has a comprehensive collection of medical literature including a centralised and digitised Library collection.